Sometimes, we just need a break from our day-to-day schedules and a chance to rejuvenate. Couples should also take the time to enjoy quality time and reconnect with each other every once in awhile. That’s why a getaway from Boston to Greenwich, CT is a great option for a romantic escape. You’ll discover plenty of things to experience that will send you home feeling relaxed and in tune with your sweetie. If you’re ready to escape to Greenwich, here are just a few things you need to know about planning a successful and memorable trip. Thinking about a getaway from Boston to Greenwich, CT? Download your free copy of our handy Greenwich Vacation Guide for hundreds of recommendations for local things to do, see, eat, and more! Boston and Greenwich are just over 180 miles apart, meaning a relatively brief journey for several modes of transportation. Whether you’re planning on driving, taking a train, or even a plane, here are the routes that we most highly recommend! Now that you’ve arrived, how do you spend your time? You could use it to explore the historical sites and parks, visit nearby towns, or lounge on the beaches doing absolutely nothing at all! Here are just some of our top picks to help you get started on filling your Greenwich itinerary. If you and your sweetheart love animals and learning new things, a visit to these Connecticut attractions is a must! The Norwalk Aquarium is located just 20 minutes from Greenwich and is solely devoted to the marine life of the Long Island Sound. You’ll have the chance to meet harbor seals, river otters, sharks, jellyfish, and sea turtles! In nearby Bridgeport, the Beardsley Zoo is the perfect place to spend an afternoon admiring over 300 animals from North and South America. For fresh and unique wines you won’t find anywhere else, you’ll want to add wine tasting to your list of “must do’s!” Not only will you have the chance to try deliciously unique wines, but the lovely vineyards create a picturesque and romantic setting for the two of you to spend a memorable afternoon. Take a look at our personal favorite wineries now! 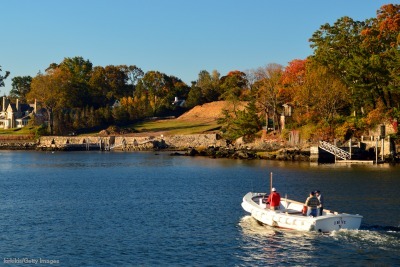 Some of the most beautiful homes in New England reside in Greenwich! If you and your sweetie are ones for dream building, this is the perfect place to do it. We recommend a leisurely bike ride along the scenic roads of Greenwich and through opulent neighborhoods. We guarantee you’ll be picking your jaws up from the ground when you see the mansions scattered among the backroads. Greenwich is a city seeping in rich history, and a trip to this New England town is almost wasted without visiting some of the historic sites. Take a journey back in time and discover landmarks that played a role in the story of America! Washington Irving’s Sunnyside: Residence of famous American author, Washington Irving. Putnam Cottage: The tavern in which Revolutionary War General, Israel Putnam, embarked on his ride to evade the British army. The Glass House: The home that ushered in the International Style into American architecture. You’ll need a place to stay for your getaway from Boston to Greenwich, CT. We invite you to relax with us at the Stanton House Inn, rated Connecticut’s most romantic bed & breakfast. Our beautiful and historic inn has been renovated to provide modern amenities without sacrificing the mansion’s historic charm. Explore our lovely guest suites and discover what makes our Greenwich accommodations truly unique. Our visitors are also spoiled with unparalleled guest services and exclusive vacation packages and specials. Ready to getaway? Book your next escape to the Stanton House Inn today! If you haven’t already, don’t forget to download your free copy of our handy Greenwich Vacation Guide to help you start planning the ultimate getaway!